NPCIL chairperson and managing director S K Jain says the corporation would soon approach the Atomic Energy Regulatory Board (AERB) for permission to load fuel in the first unit. Croatian experts are being flown in to check the equipment and the reactor pressure vessel to see if they are in good condition. There is talk of the first unit of the two 1,000 MWe VVER (light water) reactors going critical in just three months. Kocherry, 74, a congregational priest at Manavalakurchi, some 40 km from the epicentre of the struggle, makes regular trips to Idinthakarai to shore up the spirit of the protestors. He took part in the Save Water, Save Life march across the nation which culminated in Kanyakumari on May 1, 1989. 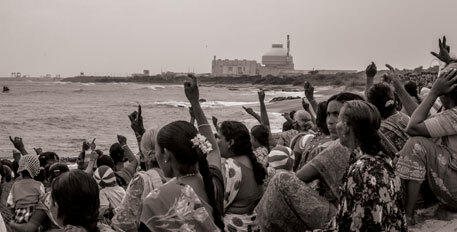 “When it reached Kanyakumari it was an anti-nuclear protest against Kudankulam. Police opened fire and injured seven, including a parish priest,” he recalls. Talk to any fisherman along the Tirunelveli coast and one begins to understand what Kocherry is saying. These are hardy folk used to taking on the administration, the police and the church. Declares Antony Ephraim Joseph, 45, of Perumanal, a small village about 8 km from KKNPP: “We will fight to the end. Let them kill all of us. We have had a tsunami here (2004) and several small tremors recently.” Ironically, the tsunami rehab colony abuts the wall of KKNPP! Fukushima was watched without a break and also the talk shows that accompanied broadcasts of the world’s worst nuclear accident after the Chernobyl disaster of 1986. There is plenty to fuel nuclear fears—and it has galvanised the resistance that NPCIL believed had died down. Some ideas are well entrenched. Gerald, who took part in the Kanyakumari rally as a teenager, is also convinced that nuclear energy comes with the added threat of nuclear weapons. “Nuclear energy is a front for nuclear weapons,” he declares. That’s because in the early days, those who organised anti-nuclear meetings in the area came from socialist and far left parties who rallied the people on an anti-war and anti-weapons plank. Above, all there was Rev. Y David, a Protestant pastor who led the Social Equality Movement and rallied the downtrodden communities. The mainstream CPM and CPI were strongly in favour of the project (it was by the Soviet Union) and shored up the Congress project. The old stalwarts are now scattered across Tamil Nadu but are still lending support to the campaign in different ways. The core of the protest comes from the close bonding of the fisherfolk through caste (Paravas) and religion (Roman Catholic). Martin, a fiery character from Idinthakarai, has just sold the day’s catch of sardines worth Rs 27,000. In the evening, he will deposit Rs 2,700 (10 per cent) with the struggle committee since it is Thursday when the weekly donation is made. 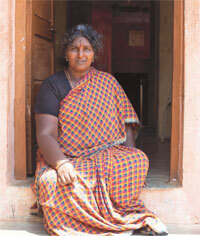 Others like Xavierammal contribute Rs 200 a month. This is apart from the contribution fisherfolk make to the village community for maintenance that includes upkeep of the parish house and other community facilities. The fisherfolk have done it for centuries, a practice that is unique to the Tamil Nadu coast, and one that keeps the people and church together. It is not surprising, therefore, that nearby villages have evaded the tight police cordon around Idinthakarai, and have come by the coast to make a contribution of Rs 3 lakh on one day. The community kitchen in the struggle hub is feeding 5,000 people three times daily while they guard the 15 activists, led by PMANE convenor S P Udayakumar and its organising genius M Pushparayan, who are on a fast unto death. Foreign money or church money is clearly not needed. Community collections have crossed Rs 30 lakh since the fasts began in August last year, and there is still a substantial amount in the kitty after meeting all expenses of the movement, says a PMANE committee member. “This is truly a people’s struggle and not a Church-funded movement,” Udayakumar, himself a Hindu Nadar, tells Down To Earth just before the crackdown started. There was a time when we did not have Rs 1,000 to mobilise people for a strike. “Now it’s unbelievable. Not even in my wildest dreams did I think it would become such a mass movement,” says the PMANE leader who teaches peace and conflict studies in institutions across the world. So how did this happen? Fukushima, of course, and the hot run at KKNPP, he says. While the overwhelming fear is about loss of resources and livelihood, the hot run conducted by NPCIL made the threat to life very real for the people, he explains. The hot run has become folklore. Description of the terror that it created varies from village to village. People speak of a frightening noise and smoke in the sky. But it is an event that did take place and one that NPCIL and the Department of Atomic Energy (DAE) rue—because it was conducted without informing the people. The realisation that the nuclear establishment has been indifferent if not arrogant about people’s concerns comes in the belated admissions made by senior officials. To start with, the fact that nothing was done to allay fears post-Fukushima. Admits S A Bhardwaj, director-technical, NPCIL, in a March 10 press conference: “Even nuclear experts were shaken by the Fukushima disaster. So if the general public or locals are asking questions, their concerns are genuine and we have to address them.” It is an admission that comes too late; and if it is a message of apology it has not reached the agitating villages. Fukushima, starting with initial dismissal of the seriousness of the disaster by top officials of the nuclear establishment in India, appears to be a nuclear accident that they prefer to gloss over. At the September 7 annual general meeting of NPCIL, the chairperson referred to the world’s second worst disaster in the following terms: “During March 2011, a significant event of fuel damage at an overseas plant was reported as an aftermath of a natural event of extreme nature.” The F word was not mentioned at all. Sometimes, those screaming valves were opened during the night, too, startling villagers out of their sleep. Worst of all when people came to meet KKNPP officials, they were not allowed to meet them. This arrogance was probably rooted in NPCIL’s desperation to get the 2,000 MWe project running before the end of the 11th Plan ending March 2012 to improve its dismal record: half a century after it began its programme the country has a total nuclear generating capacity of just 4,780 MWe. KKNPP would have increased this by nearly 50 per cent. Besides, these would have been NPCIL’s first large reactors. Its stable of 20 plants consists primarily of 220 MWe units (home grown, though) with a couple 540 MWe plants. And there is a cautionary monument just opposite the Lourdes Church: a small Ganesha temple built by the 25 families who broke away from church and became Hindus because they were unhappy with the church. Reports have it that Bishop Yvon Ambroise of Tuticorin was forced to come down to the determined Idinthakarai parish of his diocese and back the anti-nuclear campaign after a delegation met him and made their displeasure over the Church’s neutral stand very clear. He came for a day, sat with the people and offered them a glass of juice to break fast. But it is not a protest of Catholics alone, advocate S Sivasubramanian of Kudankulam village, just 2.3 km from the plant, who is a leader of PMANE, told Down To Earth. That was three days before he was arrested by the police, one of the 185 picked on the morning of March 19. “People in Kudankulam, mostly Hindus and some Muslims, joined the protest in 2007 after NPCIL’s promise to turn the area into mini-Singapore failed to materialise,” he says. The disillusionment was particularly bitter because few people had got jobs. As the protest heads for a showdown with the state, PMANE is emphasising the lack of safety at KKNPP (see next story ‘Unanswered questions’). There is little political support for the anti-nuclear movement barring from fringe parties like Vaiko’s MDMK and Ramadoss’s PMK. Let down by the chief minister, who they assumed would stand by them not least because of their stridently anti-Karunanidhi stance, Idinthakarai is hoping for a political miracle to end their agony. That appears unlikely with the Centre and the AIADMK on the same side of the nuclear divide. Reports have been piling up on the safety and environmental aspects of India’s most ambitious nuclear project, the 2,000 MWe Kudankulam Nuclear Power Project (KKNPP), in the wake of the protests that lead to a stoppage of work on the two Russian light water reactors. First, there was the finding of the 15-member A E Muthunayagam Committee, set up by the Centre, which submitted its report in December 2011 and then the report of the M R Srinivasan committee, a Tamil Nadu initiative that its chief minister J Jayalalithaa said was necessary to allay “people’s fears”. While the first report has been put out by the Nuclear Power Corporation of India Ltd (NPCIL), the report commissioned by Tamil Nadu is not yet in the public domain. According to interviews given by the former chairperson of Atomic Energy Commission, there is no shadow of Fukushima over Kudankulam. Srinivasan says he looked at issues like “deficiencies in safety at Fukushima reactor, geological factors (earthquakes, tsunami, etc) at Koodankulam” and came to the conclusion that “a Fukushima mishap will not happen here”. In sum, it appears to be an endorsement of the Muthunayagam report since Srinivasan’s four-member team concluded that the expert group “has answered all 44 questions raised by protestors”. M Pushparayan, leader of the People’s Movement Against Nuclear Energy (PMANE), says this is expected since Srinivasan headed the site selection committee and picked the location for KKNPP in 1988. PMANE’s presentation on geographical vulnerability was based on 47 journal articles and seminar presentations, and raised issues such as volcanic eruption near the reactor, Karst formation during the past three years at three locations within 25 km of KKNPP and the potential for tsunami from slumps and faults in and near the Gulf of Mannar apart from shoreline instability. It also pointed to the possibility of dry intake due to sea withdrawal observed in southern Tamil Nadu coast since 2004. In spite of the large number of studies, “NPCIL has unfortunately not looked into any of these before or during the construction of the two 1,000 MWe reactors,” says PMANE’s response to the Expert Group (EG) report. According to the latter, however, none of the issues is serious. Referring to the main worry of the fisherfolk about contamination of natural resources, EG notes that the project draws sea water from intake dykes for condenser cooling. To stop the fish from getting trapped, KKNPP uses “a unique fish protection system” that stops fish from entering the bays and returns them safely into the sea. The other issue is the rise in sea water temperature and its implication for marine life, including fish and prawns. The approximate quantity of coolant water that will be released is 70 tonnes per day with a maximum delta T of 7 degree Celsius. “In fact the mixing will be very fast due to wave action and other water currents.” As a result warm water from condenser will be mixed instantaneously and lead to “a possible reduction of ambient sea water temperature”. But PMANE says the dangers could be immense when all six 1,000 MWe reactors begin operations. The discharge of 7.2 billion litres of hot water into the sea every day by each reactor could well destroy the fish. Besides, there is the question of the chemical and radiological composition of effluents. “The EG provides data which are gross underestimations and contradictory with the information provided by NEERI and NPCIL officials earlier,” it notes. Another charge it makes is that the KKNPP reactors 1 and 2 violate the Atomic Energy Regulatory Board instructions of 1998 that require two sources of water to ensure adequate water supply in the event of a cooling loss accident, which it terms “the largest potential hazards of reactors”. Citing independent studies, the collective says the dependence on desalinated water alone is a safety hazard. EG says the storage capacity in tanks is adequate for the reactor for 10 days in case of power failure even though the regulatory requirement is seven days. The debate continues. A year ago, the triple meltdown at the Daiichi power plant in Fukushima sent a chilling reminder of Chernobyl. No matter how pro-nuclear a country was, Fukushima could not be ignored. The immediate reaction was public protests followed by safety reviews of nuclear plants. Nuclear energy came under a serious threat of being sidetracked, albeit for a short period. Japan, where nuclear power accounts for a fourth of the total energy production and which planned to increase this share to a half by 2030, altered the future energy roadmap. It now plans to supplant its nuclear programme with renewables and has also displayed intentions of using cheap imported gas for producing power. Elsewhere, the impact of Fukushima varied from negligible to noticeable. M V Ramana, professor working on nuclear energy and global security at Princeton University in the US, says countries can be categorised into three groups based on their government’s reaction. The first group includes those countries that have reiterated commitment to their nuclear plans with very little change. Their plans may be downscaled because of delays resulting from safety reviews. Good examples are the US and China, Ramana says. The second group consists of countries that have turned away from nuclear power. In many cases, Fukushima only sealed an ongoing process of gradual nuclear phase-out. This group includes Germany, Switzerland and Venezuela. The third group includes those that have temporarily shelved their plans to “continue with, expand, or enter into nuclear power”, Ramana says. “They are being held back by public opinion.” France and Uruguay fall in this category. Most of the 50-odd countries with nuclear power have adopted the logic that a massive earthquake followed by tsunami is an unlikely calamity to befall most of the 453 reactors on the planet, argues Mark Hibbs, senior associate with Carnegie’s Nuclear Policy Program, based in Germany, in a paper published earlier this year. These governments had deployed nuclear reactors for strategic reasons and have not veered off their plans. “Political leaders in these countries, despite populations suddenly insecure and restive about nuclear safety, won’t hastily foreclose future energy-generating options,” Hibbs reports. But he does notice that since March 2011 governments and industry favouring nuclear power have not succeeded in returning to business as usual. 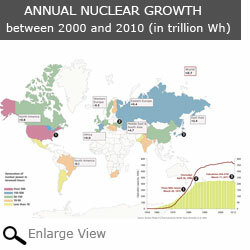 ‘World Energy Outlook 2011’, published by Paris-based International Energy Agency, estimates a more severe impact. It says new regulatory measures, especially to safeguard nuclear reactors from natural catastrophes, would delay capacity addition and renewal of old reactors. Nuclear power capacity could fall from 393 gigawatt (GW) in 2010 to 335 GW in 2035. At 2010 levels nuclear commanded 13 per cent share of the total energy market. By 2035 this could reduce to 7 per cent, the report says. After Japan announced withdrawal from nuclear energy, Germany, which sourced 23 per cent of its energy from domestic nuclear plants, decided to abandon nuclear energy. Earlier, Germany was to become nuclear-free by 2021, but in May last year it decided to bring the phase-out dates forward. It will, thus, become the largest bloc in nuclear-friendly Europe to do away with nuclear energy. Following Germany are Belgium, Switzerland and Italy. Switzerland has set 2034 as the year it will be free of nuclear power, while Italy in a referendum held in June 2011 said no to using nuclear energy. The remaining nuclear powers in Europe intend to split atoms to produce energy, but the way forward could be arduous. France has been the biggest nuclear evangelist extracting 75-80 per cent of its energy from nuclear fusion. 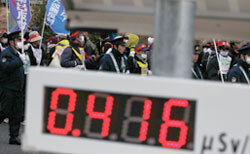 But post Fukushima pressure from the political opposition and the public is beginning to show. The Socialist Party and the Green Party have vowed to close down 24 of the 58 reactors in France by 2024 if voted to power in the April 2012 elections. Opinion polls conducted in November show 40 per cent of the French are hesitant about nuclear energy, while 17 per cent are against it. If France crumbles, the repercussions will be felt in the rest of Europe. French companies Areva and Electricite de France are major providers of nuclear equipment and technology. Britain, Czech Republic, Finland and the Netherlands have strong nuclear links with France and are pursuing plans of increasing their share of nuclear energy despite Fukushima. While Europe is slowing down, Asia is racing ahead. China always stands out from the pack no matter what form of energy one talks about. In terms of installed capacity, it has more wind power, coal-based power and more hydro electricity than any other country. Now it plans to do the same with nuclear. China was reportedly aiming to produce 200 GW by 2030. This is 20 times more than its current capacity and about the same amount of energy that India consumes. But after Fukushima, it temporarily suspended approval of new reactors. These new reactors needed to meet the target are besides the 26 under construction and 51 approved. Given the size of the Chinese power industry, nuclear share will remain tiny even after this capacity is added. China is trying a cocktail of technologies; nuclear energy is not crucial for it. Other Asian countries like South Korea and India will enter the next round of nuclear expansion. South Korea currently generates 31 per cent of its power from 21 reactors and stands firm to push this to 59 per cent by 2030. Vietnam has ordered two Russian reactors. Thailand, which was in advance stages of planning a reactor, has postponed it temporarily after Fukushima. There is another reason—bigger than Fukushima—countries are shying away from nuclear power. It is the cost. It was widely believed that the 21st century would belong to nuclear energy. The industry had anticipated that the third generation of nuclear reactors would be cheaper to build, superior in thermal efficiency and safer than the second generation ones. Concerns of climate change and talks of carbon tax to fund greenhouse gas reduction technologies too leveraged hopes for this sector. Yet instead of reducing, the cost has risen many times. In the beginning of this century it was forecast that with third generation technology, a nuclear power plant’s overnight cost—expense paid during construction minus the interest on loan—would be about $1,000 per kW and a 1,000 MW plant would cost about $1 billion. The current overnight cost of producing a kW of electricity is between $4,000 and $5,000. If all costs are included and third generation technologies, like AP1000 or EPR (European pressurised reactor), are used producing a kW could require up to $10,000. MIT, which released a report in 2007, estimated the cost of setting up a reactor at $4,000. The UK’s latest estimate—part of a report prepared by consulting firm Mott Macdonald in 2010—is that first-of-a-kind nuclear reactor could cost $6,000 per kW. This would gradually reduce to $4,500 per kW once technology gains prominence and adequate numbers are built, but this is unlikely before 2025. For first-of-a-kind 1,600 MW EPR, the construction cost would be close to $9.9 billion and for an AP1000 it would be $7.4 billion. The same year, the Nuclear Energy Agency gave estimates of $1,600 to $5,900 per kW. Take the case of the first two 1,600 MW EPR. Their construction began in Olkiluoto, Finland, in 2005 and in Flamanville, France, in 2007. Both have seen long delays and cost overruns. It was envisaged that Flamanville would be built at €3.3 billion (1€=US $1.3) and commissioned in 2011. The cost was revised in 2011 to €6 billion and the reactor will be ready only by 2016. The cost of the Olkiluoto plant was estimated at €3.7 billion but has seen overrun of another €2.7 billion. When Korea Electric Power Corporation won a contract for four reactors in UAE in 2010, it outbid Areva and Westinghouse’s Gen3 technologies. The reported cost of the UAE reactors was $20 billion. Areva’s CEO Anne Lauvergeon said the reason her company lost the contracts was additional safety features that increased cost by 15 per cent. Post 9/11, nuclear reactors have been designed to withstand impacts by commercial jets. But even the Koreans have not been able to control their budgets. Recent reports indicate the cost of these reactors has increased by $10 billion. China alone has managed to keep the cost low. Chinese news reports quote costs of about $1.8 billion for every GW generated through EPR. Through AP1000 the rates are a bit steeper but below $2.5 billion. Reasons Chinese have been able to keep costs low is tight scheduling—most plants are either on time or ahead of deadlines—a good base of vendors for components and cheaper and more pliant workforce. But the big secret is state loans for most projects. This brings down the interest on loan. In 2010, China Daily reported the China National Nuclear Corporation planned to invest close to $120 billion in nuclear energy projects by 2020, and by 2015 its controlling stake in power plants would be $75 billion. The Chinese example is difficult to replicate in the West. In 2008 and 2009, like UAE, South Africa and Canada rejected Gen3 reactors because of the exorbitant cost. Problem arises when investors seek return guarantees, which can push the cost of capital sky high. Unlike in thermal power, financiers have little faith in nuclear plants and hence may charge higher interest. Mycle Schneider and his team, in a paper on world nuclear energy published in 2011 by the Washington-based Worldwatch Institute, argue the cost of capital is pivotal to nuclear reactor economics. “The capital cost depends in part on the credit ratings of both the country and the power utility in question; countries with more stable economies tend to get lower interest rates, as do utilities that have sounder finances.” There are other variables like whether the utility seeking finances is the only player in its area of operation. Companies which have monopolies tend to get cheaper loans as increase in cost can be passed on to the consumer. British Energy, which owns eight nuclear plants in the UK, went bankrupt in 2002 because it operated in a competitive market; the government bailed it out with £10 billion (US $15.9 billion). Governments are trying to give financial support to nuclear projects, as guarantors or by using taxpayer’s money. The Olkiluoto project has the backing of the governments of both France and Sweden, a co-builder. The first two projects in the US—Georgia Power’s Vogtle project for two Westinghouse AP1000s in Georgia, and Maryland-based Constellation Energy’s Calvert Cliffs project for an Areva EPR—have also got state guarantees. For Vogtle, the first nuclear plant to be built in 30 years in the US, the estimated cost for two reactors is close to $14 billion, of which $8.5 billion is covered under state guarantees. Here the government has gone a step ahead to use money gathered from electricity users in the state through a cess. That’s how the financial burden on Georgia Power for the two reactors is only $6.5 billion. There has been a call to use carbon tax to fund nuclear energy. John Rowe, former CEO and chairperson of Exelon, the biggest nuclear energy producer in the US, has said that about $100 per tonne carbon would be required for nuclear energy to break even. The British government is considering imposing tax and preferential tariffs to bring nuclear on a par with renewable energy. Nuclear energy has too many ifs and buts. Small wonder power companies are now flirting with shale gas. Power companies, at least in the US, have identified their next big target: shale gas, or methane trapped in clay and rock. Not only is shale gas cheap—about 30 times cheaper than oil—the industry estimates there are enough reserves in the US to last 100 years. John Rowe, former chairperson of energy giant Exelon, admitted just before his retirement in December that the future of power generation lies in shale gas. Companies are increasingly looking at natural gas—shale gas is categorised as natural gas—for meeting electricity demands. Between 2011 and 2015, close to 260 plants can be built in the US that will use natural gas as the fuel, according to government statistics. The share of shale in the total natural gas production in the US in 2010 was 23 per cent (5 trillion cubic feet or TCF), as per the US Energy Information Administration (EIA) data. By 2035, it may go up to 49 per cent. The US is heavily banking on natural gas. Between now and 2035 the country will add 222 GW of generation—a jump of 20 per cent. Of this expansion, gas will account for 58 per cent. In comparison nuclear share will be 4 per cent and coal will contribute 8 per cent. Low cost and mature technology make shale more attractive than nuclear. Chandra S Rai of Mewbourne School of Petroleum & Geological Engineering at University of Oklahoma says shale gas has brought down the cost of producing electricity. Reported cost of nuclear energy is between $6,000 and $8,000 a kW (International Energy Agency maintains it is $5,300). For a gas-based plant it is less than $1,000 per kW. Nuclear projects face long delays, especially for first-of-a-kind plants, but gas-based plants take not more than five years to be commissioned because they are based on matured technology. Companies, which previously owned nuclear power plants, are slowly shifting to gas. Virginia-based Dominion Resources Inc, which owns seven nuclear power plants, constructed its first gas-based plant in May 2011. It plans to make two more such plants. Attractive as it is, shale gas faces certain hiccups. W John Lee of Houston University says just because an area has reserves does not mean all of it can be commercially extracted. In its 2011 Annual Energy Outlook for the US, EIA had estimated the total shale gas reserves in the country at 827 TCF, but has recently revised it to 482 TCF. Marcellus Shale Fields, the largest in the US, was initially said to have about 410 TCF of gas; the revised estimate is 141 TCF. There is another cause for worry. Recent studies show drilling shale gas can contaminate groundwater. The drilling process called hydro fracturing—shortened to hydrofracking— involves injecting a solution of mostly water and sand, but also pesticides, surfactants and benzene-based chemicals into shale formations. The US Environment Protection Agency has blamed hydrofracking for polluting the groundwater in Pavillion, Wyoming. The agency’s study, released in November 2011, found high levels of benzene and petrochemical-based products in the groundwater. It also found 2-butoxyethanol phosphate, phenols and naphthalene in the aquifers. Another study in early 2011 by Duke University has also blamed the shale gas industry for flammable levels of methane in aquifers. 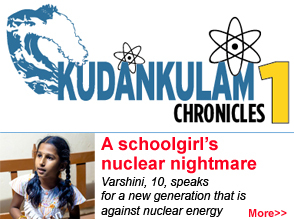 Among the major unresolved problems of the Kudankulam Nuclear Power Project (KKNPP) is water. KKNPP requires fresh water as moderator and as coolants and its entire requirement are met through desalination plants. Strangely, the Expert Group set up the Central Government on the safety aspects of KKNPP is silent on two critical issues. One is the question of drinking water requirement of the campus. The reserve water available in two tanks meant to store potable water is 1425 m3, whereas the daily requirement is 1272 m3. Even if the consumption is reduced when the supply chain breaks down, the reserve may not last more than 2-3 days. The other issue is the possibility of failure of the desalination plants due to causes other than grid failure. The expert committee considered grid failure alone as the only probable event. If the grid fails, the reactors will shut down automatically and hence the coolant requirement will be about 800 m3 for two reactors. (All reactors rely on grid power for maintaining their safety related pumps and instrumentations as the grid is more reliable than the reactors.) A desalination plant is a complicated machine for cleaning and sterilizing a chemically and biologically complex medium. That machine can also fail due to wear, tear and corrosion or due to an attack of marine organisms like jellyfish, called fouling agents by the industry. With global warming, jellyfish are poised to recapture the empire they lost some 600 million years ago. Their intrusion in desalination plants, ships and power plants has been on the increase during the last couple of years. In July-August 2011, nuclear power plants in Japan, Scotland and Israel were shut down due to their ingress, a feat that half a century of anti-nuclear activism could not achieve! KKNPP with a capacity of 2,000 Mwe does not have pipes drawn from off-site locations or elevated water towers unlike other campuses. For instance, the Madras Atomic Power Station (MAPS) has 28,400 m3 of fresh water for its reactors of with an installed capacity of just 440 MW(e) and the campus is augmenting its water reserve with an additional reserve of 750 m3 as recommended by the Fukushima Task Force. Despite the stringent conditions laid down by the Atomic Energy Regulatory Board, it has not pulled up NPCIL for its inaction on fresh water at KKNPP. It is clear that NPCIL did not do its homework before signing the contract with the Russians. They constructed the KKNPP campus in violation of the terms and conditions laid down by the AERB. Since the backup for coolant water is insufficient, the commissioning of the reactor will be a dangerous gamble. We are scared of nuclear power and yes we have a reason for that. The reason is that we are scared...! When Thomas Edison invented his generator and began producing and providing electricity many people were so scared that they stopped opening their doors. They preferred dark nights to light. Similar kind of fear has take over us. We forget that energy in any form is hazardous. Look at that tiny match-stick-it can cause havoc if misused or used by an innocent child. Question is that should we go back to caves? A nuclear accident, unlike other accidents, can ruin our habitats and us for years to come. To protect our Earth, we should be prepared to even go back to caves should we fail in other sources of energy. NO TO NUCLEAR MONSTER. Jai Hind! A question for you is if you can take a risk A, does it mean you can take risk B too when A and B are not related at all.? By saying yes to nuclear plant, you vouch for the children to be born. A electric generator can be switched off within one's life. A nuclear reactor creates demons that outlive with a great danger for several hundred years that covers your generation and a few more to be born. It lives even when it is not operational. There is huge difference between A and B. People are scared of the differences here. Some one below has clearly answered if we should go back to caves. While Rajiv Gandhi was linked with the Bofors deal, he also signed an agreement with USSR for importing the unusual type of reactors from Russia. The Janata Dal Government also followed the same ethics to re-enter into another agreement with Russia to import the light water reactors of VVER type which are considered unsafe even at that time. Moreover, nuclear power was three times more costly than hydro-power and twice more costly than thermal power and yet inspite of its negligible contribution to national power, yet for the benefit of contractors and politicians while being simultaneously harmful to public health and welfare, the deal was struck inspite of objections from the public since 1988 itself. Prof.Shivaji Rao the International Environmental expert who published a book with title Ã”Ã‡Â£Nuclear Plants are Silent KillersÃ”Ã‡Ã˜ in 1989 and also published a paper on Environmental Impacts of Kudankulam Nuclear Plant 1990 in the magazine Religion and Society, Vol.XXXVII, No.2 June 1990 by highlighting the Risks involved. The nuclear industry continued to mislead the Tamil Nadu Chief Minster, the Prime Minister and the members of the state legislature and Parliament and went ahead with the construction of the project by violating all the rules and regulations under different laws. Recently, the nuclear plant authorities again misled the Chief Minister and Prime Minister who are unknowingly proclaiming that nuclear power is absolutely safe while the heads of Germany and Japan have confirmed that nuclear safety is a myth and also decided to phase out all the nuclear plants in their country by 2022 and by 2030. It is said that fools rush in where angels fear to tread, which means that inexperienced and rash people will attempt to do things that wiser people are more cautious of. Since the state and central governments are not interested in the safety of the common people the public have to protect themselves as per sec 51 A(g) of the Indian constitution in the interests of their future generations as well. Even God cannot help those who refuse to help themselves by discharging their duties as responsible citizens of India. Among other things, in the United States protective actions recommendations are implemented when projected doses could exceed 1 rem to the body or 5 rem to the thyroid. A rem is a measure of radiation dose. The average American is exposed to approximately 620 millirems, or 0.62 rem, of radiation each year from natural and manmade sources. In making protective action recommendations,the NRC takes into account a variety of factors that include weather, wind direction and speed, and the status of the problem at the reactors. Attached are the results of two sets of computer calculations used to support the NRC recommendations. In response to nuclear emergencies, the NRC works with other U.S. agencies to monitor radioactive releases and predict their path. All the available information continues to indicate Hawaii, Alaska, the U.S. Territories and the U.S. West Coast are not expected to experience any harmful levels of radioactivity. With regard to evacuation of Americans living in Japan in the neighbourhood of Fukushima nuclear plant the US Government calculated the impacts of radioactive pollutants from the Fukushima reactor accident and took into consideration the disaster management zones which were limited to about 20km and found the underestimated values for disaster management which in USA extend up to 80km from the nuclear plant. Having found that Japanese standards for evacuation of potential victims is too inadequate Americans calculated the distances up to which excessive radiation dose will extend and found that the risky zone extends upto 80km and so US advised their nationals in Japan to evacuate upto 80km from the Fukushima site to ensure public health and safety and the following air pollution modeling studies were done for this purpose. Inspite of these values Japanese Government applied safety measures for evacuation upto 30km compulsory zone and upto 40km voluntary evacuation zone although the excessive radiation was found in locations upto about 60km from Fukushima reactors. In the case of Kudankulam plant the plant authorities failed to follow these safety standards. Moreover NPCIL and AERB told the Supreme Court that they are not concerned to implement all the levels of safety because the key component relating to the 5th level of safety pertaining to the off-site disaster management plan is the total responsibility of the state Government and the local District Collector who is not duly qualified to implement total safety measures. Thus the Prime Minister and Chief Minister of Tamil Nadu are totally misleading the public by stating that the nuclear plant is completely safe without really knowing the total aspects of safety of nuclear power. Development is only possible with risks. But, at the same time when the government takes an initiative to fund the development such as the nuclear reactor to produce energy, the concerns of the people should be the foremost and they must be answered.